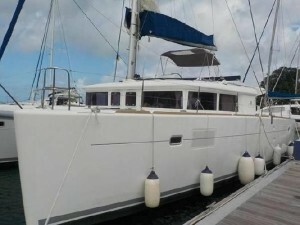 This 2013 Lagoon 450 Flybridge is presented in great condition having been well looked after by her current owner, she is currently being used for charter in the Caribbean. She has recently benefitted from new sails, cushions, generator and batteries. Her owner is motivated to sell. 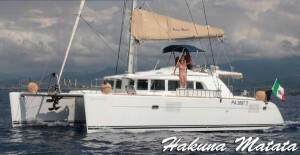 She is powered by two Yanmar 4JH5CE 54hp diesel engine with sail drive. She is also equipped with an Onan 11kva diesel generator and Cruisair air conditioning. Sails on board this Lagoon 450 include a Dacron fully battened main sail and a furling genoa with UV strip. Her rigging features an aluminium mast with double pushing spreader rig, aluminium boom, forestay with genoa furler, 2x mainsail lazyjacks. 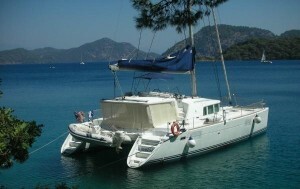 Accommodation for 6 guests is provided on board this Lagoon 450 Flybridge. To starboard is a huge master suite featuring a large cabin with centreline queen-sized double berth; a lounge/dressing area with sofa seating, dressing table and plentiful hanging wardrobes; and an ensuite bathroom with separate sower cubicle. To port are two further guest cabins, each featuring a double berth (queen-sized bed in aft cabin); plentiful storage in wardrobes and under-bed drawers; and ensuite bathrooms with separate shower cubicles. There is also a further crew cabin located forward to port-side. The spacious saloon and galley are located on raised level, with wrap-around windows offering great views and plenty of light. The saloon features a dining area with sofa seating and a dining table, there is also a navigation station with helm seat. The galley is well equipped with double stainless steel sinks with integrated drying rack, microwave with grill, oven,130l front-loading refrigerator and a 110l freezer. The cockpit is accessible through a sliding saloon door, and features a deck saloon space with sofa seating and a table for al-fresco dining and a sun lounger to starboard. There is also an icemaker in the cockpit. The cockpit is covered by a hard-top bimini. The foredeck features a further sofa seating area and access to the forward anchor and windlass. Two staircases lead from the cockpit to the flybridge. The flybridge features a helm position with a great view over the boat, there is also a long sofa for guests to relax and a large sun-pad area forward. 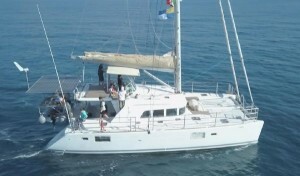 The flybridge is sheltered by a folding bimini. This Lagoon 450 is also equipped with a Caribe C10 tender with a Yamaha 9hp outboard engine.